Following the exciting super play finish in the earlier finals, THBS and Unisys stepped on to the field in the hope to take the winners trophy home in this finals. Vishal opened with Arun as THBS continued to stretch their top order a bit for the second game running by batting Lalit down the order and for once it seemed to pay dividends. The openers got through the powerplay overs without any wickets though Unisys kept a tight check on the flow of runs. Murthy struck in the 7th over when he sent Vishal back. Then Kaushik sent back THBS’s player of the tournament Arun in the next over. The onus fell on the skipper Chandan to steer his shop off troubled waters and he set about doing just that in a sensible partnerhip with Dheeraj. Runs came quickly in the next 5 overs as boundaries were both conceded with daft bowling and some good strokeplay. Dheeraj’s wicket in the 13th over set things back for THBS again as Mallikarjun weaved his magic flicking his carrom ball deliveries with remarkable accuracy. He accounted for Shreyas the next ball and forced THBS to take a cautious approach to avoid a collapse. It ended up being a game of cat and mouse between Mallkarjun’s 4 overs in the end and Chandan trying to marshal his troops to a decent total. Chandan held firm even as the rest struggled against the guile of Mallijarjun. Chandan tried his best to make runs at the other end and pushed his team to a total closer to 130. And given their bowling form through the tournament, it was a challenging total on the board. Vaibhav struck in his first over and the second of the innings to put Unisys under early pressure. But Harish was in good form continuing his run from the last game as he found boundaries. But THBS kept at the Unisys batsmen in check as the combination of Vaibhav, Dheeraj and Arun chipped away at the wickets and had knocked 3 of the wickets before the powerplay ended. 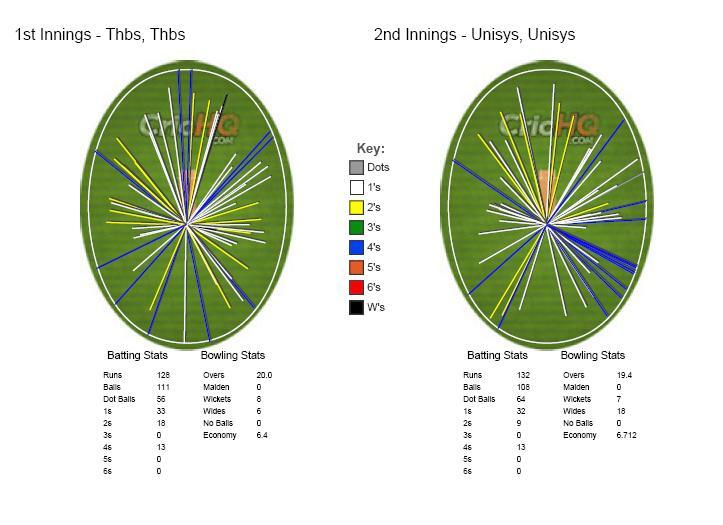 Harish and Vikram mended the innings with a little partnership that put the innings back on track and with Harish looking good to anchor the chase to a win but fell in the 10th over as THBS kept Unisys under 6 an over. Abid joined Vikram and the pair put on another crucial partnership over the next 5 overs to set up the chase beautifully. The bowling hero Mallikarjun joined Abid with roughly 8 and over needed in the last 5. 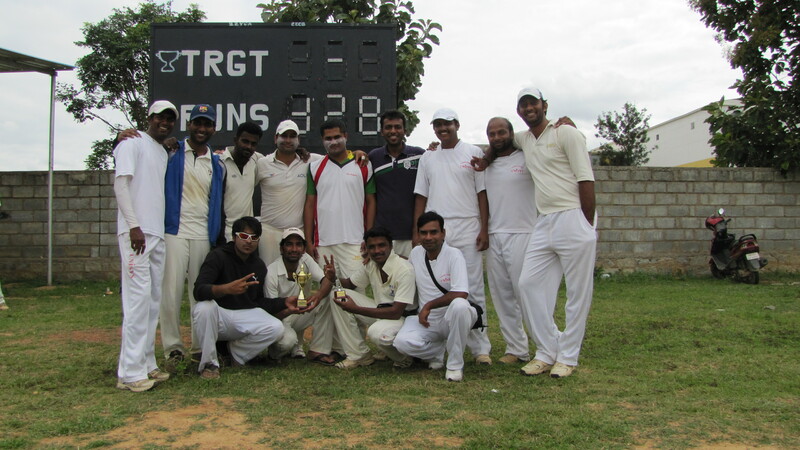 Abid maneuvered the bowing well and Mallikarjun played the aggressor as the pair chiseled away at the THBS score. Vaibhav returned to bowl an inspiring spell sending back a well set Abid followed by the wicket of Prashanth to make the game more interesting. With 20 needed off 16 balls at the stage, THBS realistically needed to get Mallikarjun’s wicket to remain in the hunt. As it turned out, Mallikarjun soaked the moment and the pressure well as he took his team to a memorable victory in the last over.